KENYA: Kilimanjaro Blind Trust Africa conducted 2 days training for 30 school-based Braille Repair Technicians on the use of its new Mobile Short Code reporting platform. The process entails use of an ordinary mobile phone. Technicians access the platform for free through their mobile phones to relay their monthly performance reports to the headquarters in Nairobi, Kenya. The system also allows them to relay data on the number of blind children and Braille machines in their schools, reports on the use of Brailler spare parts as well as to make requisitions for supply of parts and other consumables. The platform also supports bulk short messaging to all Technicians and Coordinating Itinerant Teachers (CITs) in schools. Effectively, KBTA is able to send a single short message to all Technicians and CITs at the same time. This has improved communication between KBTA and schools. The training was conducted by the lead System Developer, Mr. Bernard Mosomi who is working closely with the leading Global Mobile Telephony provider in Kenya, Safaricom Limited. Two senior officers from the Ministry of Education, Science & Technology Mr. Fredrick Haga Ochieng (Senior Assistant Director of Education, Special Needs) and Mr. Chris Okange (Principle Quality Assurance Officer) attended the training. As a way of motivating the Technicians to work smart, 3 of them; Mr. Peter Mucheru, Wilson Kurui and Lawi Malenjeh were recognized for their best performance in repair and maintenance of Braille machines as well as quality and timely reporting. 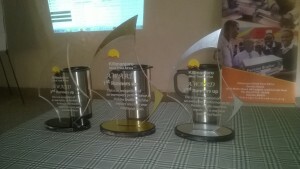 They were awarded with a trophy and a KBTA – branded mug each. All participants were awarded with a certificate. It is expected that this platform will ease reporting process by technicians as well as enhance data collection and quality of reports. Soon the initiative will be replicated in other partner countries namely Uganda, Tanzania and Malawi. This entry was posted in Brailler repair, KBT News. Bookmark the permalink.